Pride was lyrical, imaginative, and a fresh take on Pride and Prejudice. It took all the elements I love about the classic, and re-imagined them in such a vivid and wonderful way. Pride was stunning. I was sold from the very first sentence. 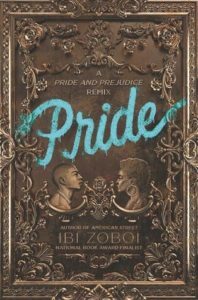 Zoboi transforms Pride and Prejudice into a book that has so many great parallels. I have never lived in Brooklyn, but you could feel the setting as another character in this story. Zoboi manages to retain the foundation of the original, while also taking us somewhere entirely new with a fresh new story. Not to mention there’s also poems in this book that are lyrical and touching. Such a win in my book. I couldn’t get to Pride before it released, but in some ways that makes me really happy because I got to listen to it read by Elizabeth Acevedo. Talk about a narrator who can make the words come alive. I adored listening to Acevedo read Zuri’s poems and hear the emotion in her voice. This audio book really take the entire book to a new level. If you haven’t read the original, I don’t want to spoil this book for you. Because you can totally read this without the original. It isn’t required at all and in fact you’ll probably be more surprised by events in this book. But the jist of pride and prejudice is a book about love, and classes, and is a romantic comedy in most ways. It deals with a character who is too full of pride to see beyond what they think they know, and hard to admit when they’re wrong. And another who is too prejudiced, who thinks they know exactly who you are by seeing you. And some of the beauty in the book is that these two qualities almost merge into each other. Because in Pride we have two teens who think they know, and whether because of pride or prejudice, find it difficult to see another side. Zoboi’s Pride begins with a bang, taking on issues of gentrification and identity from the first sentence. Zuri watches her neighborhood become transformed, as wealthier people move into Brooklyn, and the dynamics of the street change. Whereas Darius is the newcomer on the block and a family that comes from money. And so the main question becomes, can these two come together and get over their pride, their prejudice. I mean at first the question is, can these two even stand each other. But as they get to know each other, they find more and more similarities, hidden secrets, and ways they challenge each other. Zuri is a powerhouse. She is passionate, loyal, and fierce. I love how quickly she acts (sometimes without thinking), and her desire to go to college, her lyrical poetry, and her steadfast determination to make it her own way. I fell in love with her from the beginning and her poems that cut to the heart of you, only made me love her more. And if you love fierce girls who still have room to grow, then Pride definitely has to be on your list. Find Pride on Goodreads, Amazon, Indiebound & The Book Depository. Do you have a favorite Austen book?